Immature embryo and young infloresence-based tissue culture studies in wheat. Isolation and characterization of stress associated proteins and genes in different wheat varieties and development of screening techniques (plant transformation and analysis of transgenic plants). Effect of synthetic auxins, especially PSA-6, on the formation of somatic embryos and on the growth of stress induced plants. Isolation of alfalfa cell suspension protoplast and transformation with cell cycle genes by PEG-mediated direct DNA uptake method. Direct gene transfer into immature wheat embryos via particle bombardment. Poster award to encourage young scientists (in XII. National Congress of Biochemistry, April 13-16, 1994, Istanbul, TURKEY). Mavituna, M. , Setenci, F. , Pourrestegar, N. , Oktem, H.A. , Allahverdi, S. and Yucel, M. 1994. "Salt Stress Responce of Turkish Wheat Cultivars Treated with Auxin-like Hormone Polystimulin A-6 (PSA-6)". (Turkish Journal of Biochemistry Vol 19, 1994), XII. National Congress of Biochemistry, April 13-16, 1994, Istanbul, TURKEY, Abstract Book, C-353. Mavituna, M. , Setenci, F. , Allahverdi, S. , Oktem, H.A. , Yucel, M. "Regulation of Photosystem- II Activities and Protein Synthesis by a Synthetic Hormone Polystimulin A-6 Associated with Salt Stress in Turkish Wheat Cultivars." International Symposium on High Salinity Tolerant Plants Conference. 12-16 December 1994, Karachi, PAKISTAN. M. Bilgin, D. Dedeoglu, F. Setenci, F. Ayaydin, M. Mavituna and D. Dudits. " Utilization of Replication-Dependent Histone H3/H4 Promoters Linked to GUS Marker Gene As an Indicator of S-Phase Activation in Plant Protoplast " EMBO Workshop, 1995, Szeged, HUNGARY, Abstract Book, P3. Öktem H.A., Soyer Y., Setenci F., Yücel M. "Herbisit Direçli Transgenik Tütün Bitkilerinin Gelistirilmesi". Türkiye 2. Herboloji Kongresi, 1-4 Eylül 1997, Izmir, TÜRKIYE, Bildiri Özetleri, sayfa 33. 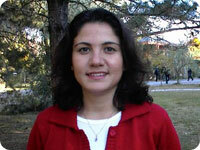 Oktem H. A., Setenci F., Yucel M. "Development of PPT Resistant Transgenic Tobacco" 8. European Congress on Biotechnology, 17-21 August 1997, Budapest, HUNGARY, Book of Abstracts, pg 44. Oktem H. A., Eyidogan F., Ertugrul F., Yucel M. "Marker Gene Delivery to Mature Wheat Embryos via Particle Bombardment" Turkish Journal of Botany, 1999, (23), 303-308. "Farklı Bitki Transformasyon Vektörlerinin Hazırlanması ve Protoplast ve Agrobacterium Sistemlerinde Denenmesi", TÜBİTAK Temel Bilimler Araştırma Grubu, TBAG-1586 no'lu Proje. "Generation of Transgenic Wheat Varieties Against Salt and Drought Stress" XII. Congress of Biotechnology, 17-21 September, 2001, Ayvalık-TURKEY. Abstract book, 67-71.